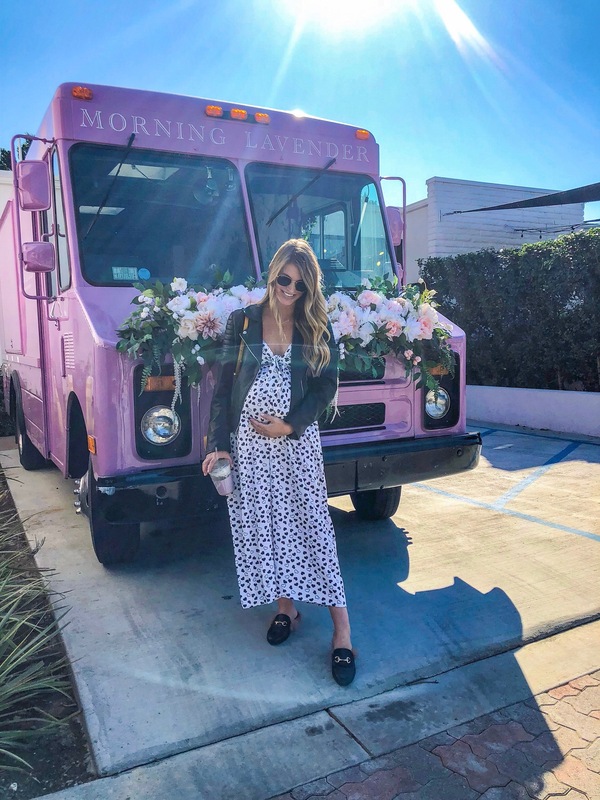 I’ve been getting a lot of questions about baby shower dress inspiration and thought it would make for a fun blog post. Early on in my pregnancy I decided I wasn’t having a shower this time around. I was pregnant with Crosby exactly two years ago and was blessed with two beautiful showers for her. We have a lot we can reuse on baby boy and I’m often sent new products to try out. There’s really no need for another shower. I will admit, as I got further along in this pregnancy I realized the shower is for more than just the stuff. When you don’t have one it makes your pregnancy almost feel anti-climatic and a little sad that there’s no celebration. But that’s probably the pregnancy hormones talking. Let’s talk baby shower dresses! First of all, don’t feel like you have to wear a maternity dress for your shower. For my first baby shower I actually ended up finding my dress at Forever 21 (see the blog post here). There are so many cute options that are non-maternity and still work with a growing bump. I love this dress (also comes in black) for a shower. It looks super comfy and would be so flattering with a baby bump. Another favorite from Free People is this dress (comes in ivory too). The square neckline is a fun touch, but the dress itself is so flattering. I love a tighter dress with a slit with a baby bump. I’m thinking about ordering it for maternity photos in a few weeks. I think wrap dresses can be really flattering for pregnancy. This one is really pretty and would work great with a bump. I took a deep dive down the Forever 21 site to find the best bump-friendly dresses. First we have this one that I actually wore in our family photos last fall. I went with a small and there was still plenty of room for a bump and think it will actually fit better now. I also love this one with the crochet top. This flounce maxi, this baby blue one, this sweet one with the floral print and this leopard print slip dress. My tip for purchasing from F21 or really any non-maternity dresses is to go up at least one size. When in doubt order 2 different sizes just in case. As far as maternity dresses go, my favorite place to shop for them is Asos. I got my blush baby shower dress there two years ago (see post here). Lots of the maternity dresses are just maternity versions of regular dresses on their site and the others are usually cute too. This one is so pretty. Another one I love is this one. It’s actually really similar to the dress I wore. Pink Blush is another maternity go-to of mine. Their dresses are cute and flattering for pregnancy. Love this one (it comes in green and blue too) and think it would be perfect for a shower. This off-the-shoulder dress is another option I love.